There are many different coffee-based drinks on an average coffee-house menu. But what makes them different from each other? What are the differences / distinguishing characteristics between: latte, caffe misto, cappuccino, mocha, macchiato, Americano, and Cafe Au Lait? Espresso: This is a finely ground very dark roast coffee, packed somewhat tightly in a special metal filter, with water "expressed" through it under pressure. A very strong dark coffee, typically served in 1-2 ounce portions. Very commonly incorrectly called "Expresso." Americano: Italians typically don't drink American Strength coffee. They drink espresso in tiny cups. Then the tourists came and wanted a mug of coffee like they get at home. The Italian solution was to make an espresso and keep the water running through the grounds to weaken the coffee, and make the desired quantity. (edit: Some locations may simply add hot water to the espresso in the cup. This doesn't change the basic concept.) An Americano is simply an espresso that has been drawn out with extra water to an American strength beverage -- Not to be confused with the typical brewed coffee, which is usually filtered. Caffe au Lait: This is strong filtered or brewed coffee (not espresso), with warmed milk. This is probably the easiest specialty coffee to make at home. Just scald some milk in a pot and pour it over strongly brewed coffee. Cappuccino: A 1:1:1 ratio of espresso, steamed milk, and milk foam. Typically the milk is steamed through a special high pressure steam pipe on the espresso machine. This serves two functions. To warm up the milk and to create a stiff foam on the top. When pouring, the foam is held back with a spoon, and then scooped out on top. I'll arbitrarily define the cappuccino as the base beverage for all that follow. Macchiato: Typically in North America, this is a cappuccino, but with the steamed milk component missing. That is, it is espresso and frothed milk foam only. Also called a "Dry" Cappuccino. Macchiato has different meanings elsewhere. Latte: A "wet" cappuccino. Hold back the foam with a spoon, and pour the warm milk over the espresso. Put a little bit of foam on top for decoration only. Mocha: Any one of the above espresso + milk drinks with chocolate added. Some places will add hot chocolate to the drink, others will add a chocolate syrup. A mocha latte is the common preparation. Not to be confused with Mocha beans, which are an Ethiopian coffee bean which has a little bit of a naturally occurring chocolate flavour. Misto: A Starbucks synonym for a Cafe au Lait. Latte: An espresso drink that consists of espresso, steamed milk, and foam. In a latte there is a greater percentage of steamed milk than foam. Mocha: An espresso drink that consists of espresso, steamed milk, foam, and chocolate syrup. In a mocha the chocolate syrup in stirred with the espresso to create a caffeinated hot chocolate with foam. Cappuccino: An espresso drink that also consists of espresso, steamed milk, and foam. In a latte there is an equal percentage of steamed milk and foam. In a wet cappuccino there is a slightly greater percentage of steamed milk. In a dry cappuccino there is almost no steamed milk and consists of almost pure foam. Espresso Macchiato: A real macchiato is a shot of espresso and a single dollop of foam on top. The shots can vary from 1 to 4. Any more takes too long to pull and spoils the first 2 shots. *Starbucks has a drink called a caramel macchiato which is just an inverted latte with vanilla syrup at the bottom and caramel drizzle on top. Americano: A cup filled with hot water and topped with espresso shots. An americano is an alternative to a regular cup of coffee and usually is more flavorful. Cafe Au Lait: A cup of coffee filled 1/3 of the way with steamed milk. An au lait is preferred by customers who want to add milk or cream to their coffee but do not want to lose the heat by adding cold milk. Red Eye: A cup of coffee that has shots of espresso added to make it stronger. 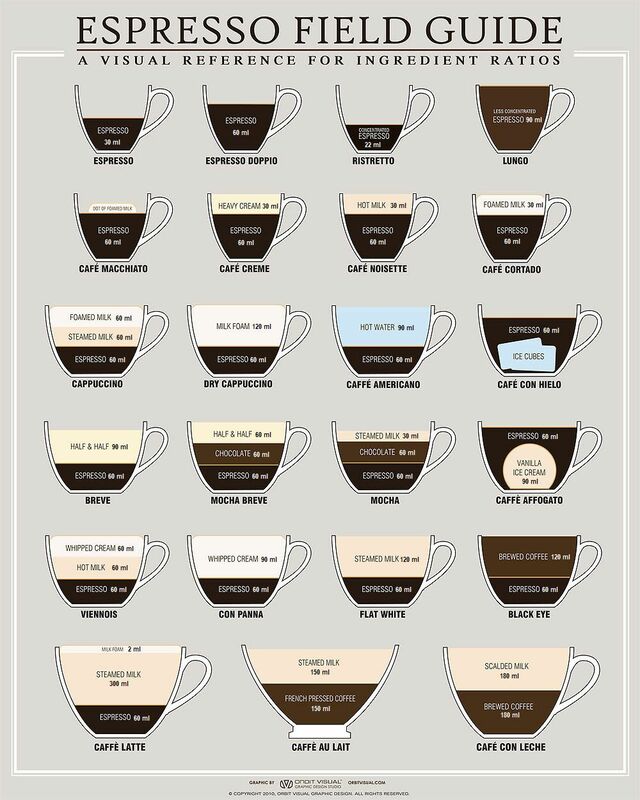 There is a fantastic graphic from Oatmeal, that explains the contents of most of your coffees. I'd argue that a true cappuccino only contains foam, and no steamed milk, but besides that, to me, it's quite accurate. The one it doesn't mention that I've made before, and is often confused with a mocha is a Cafés viennoise. This is a latte where the milk is replaced by hot chocolate. Irish coffee (Irish: caife Gaelach) is a cocktail consisting of hot coffee, Irish whiskey, and sugar (some recipes specify that brown sugar should be used), stirred, and topped with thick cream. The original recipe explicitly uses cream that has not been whipped. The coffee is drunk through the cream. What's the chemical difference between normal coffee beans and Kopi Luwak? What is the difference between instant and filter coffee? Is there a significant difference between French press coffee and Moka pot coffee? Is there a significant difference between Turkish coffee and Moka pot coffee?